Now this colored restoration I think worked very well. I like how it glows and I think it does bring them to life a bit. 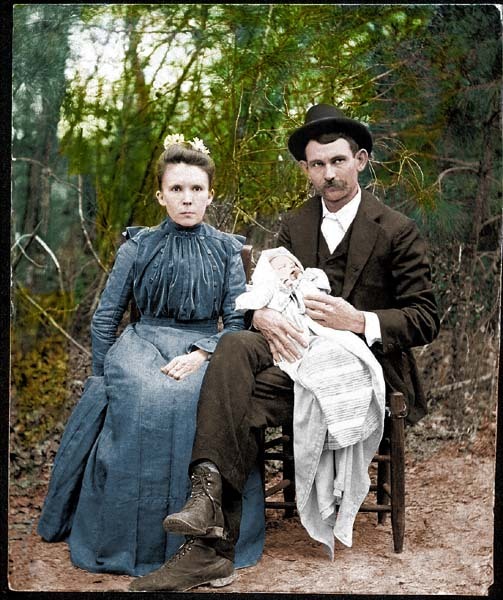 James Leon Hennesy (4 May 1873 – 1938) and Lucy Virginia Myles Hennesy (abt 1871 Jan 28 to 22 July 1906) married 1900 Jan 28 in Washington Parish, Louisiana. There was no indication on the photo of photographer or date. I don’t know which of their five children this might have been, but I would imagine it was a christening photo. Zula was the oldest child but we don’t have a secure birthdate on her. 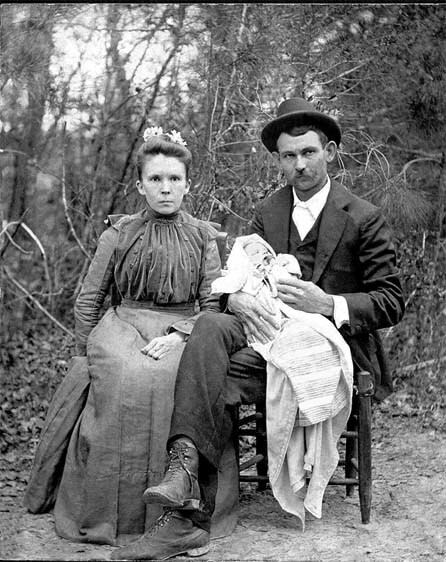 Their eldest son, Jewel, was born, it seems, Dec 25 1901 (someone had given me a date of Oct 25 at one point). Zula in the 1910 census is given as being 8 years of age and in 1920 she is 19. Her Louisiana death record gives an estimated birth of 1901. Impossible. Even if Jewel was born in December, Zula could not have been born in 1901, not with Jewel having been born in December of 1901. So I suppose we should figure on a birthdate of 1900 for Zula. I’ve seen a photo of a relative wearing a dress similar to Lucy’s, the same ornamental ruffle at the shoulder, and that photo is given as being from 1902. Zula and Jewel were born so closely together that it’s going to be difficult to fix on who this child is by a time frame. The picture could even be possibly of Esmond Edward Hennesy, b. June 1903. The child looks to be perhaps a month or two months at most, but the landscape is such that it’s difficult to tell whether it’s spring or fall. For instance, the flowers in Lucy’s hair would indicate spring, but a tree behind appear to be defoliated, and what if the flowers were instead decorative costume flowers? So it could be fall. Or it may be spring and they’re simply seated before that woodsy kind of undergrowth that is always more branches and vines than foliage. The forest palate is mostly piney evergreen so it’s near impossible to say, at least for me. To be considered then is whether they would have had a special photo made of only one child or would they have included the other children as well. If one is inclined to think they would have had a family photo made then as there is only one child this may be Zula. Or perhaps this photo ended up with Esmond and Ethel because it was a photo of Esmond. 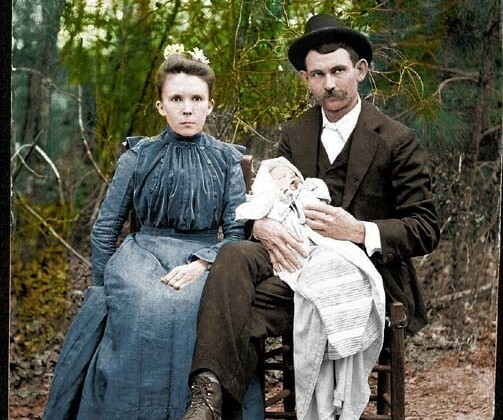 Lucy had 5 children between 1900 and 1906. That’s a lot. Too many. Her death was associated with the last birth. She perished and the child, Zeta, died two days later. Volume Two Bible Records 1961: Pages 1 – 60 Bible of Samanthy Lewis. Gives 28 January 1871 as dob.